Horizons Greater Washington Board Chair Brenda Jews accepts the plaque from Reggie Grant, Fair Chance Training and Capacity Building Specialist. 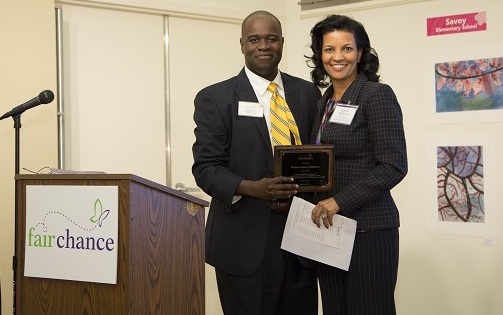 In March, Horizons Greater Washington was honored by Fair Chance, a nonprofit organization which provides assessments of nonprofits' strengths and goals in the DC region. More than 150 nonprofit leaders, supporters and volunteers attended the ceremony. Each year, Fair Chance chooses nonprofit partners to provide them with free expertise in organization management. The Fair Chance, Horizons GW partnership began a year ago when Horizons GW was accepted into Fair Chance's rigorous work plan, which includes incorporating eight capacity-building services in a process to identify key areas for improvement. On March 19, the nonprofit organizations who have taken part in Fair Chance's program over the past year graduated from the regimen. Horizons GW was only one of many nonprofit organizations who were honored at the Fair Chance graduation, as the press release notes. The nonprofits, all of which work in Washington, DC's most underserved communities, graduated from an intensive, yearlong program implemented by Fair Chance to increase their organizational effectiveness. This program is highly selective and only offered to promising or growing nonprofits serving children living in poverty. We are happy to now be among the Fair Chance alumni and look forward to putting our newfound skills to good use.